Acne, clinically known as acne vulgaris, is a common human skin disease affecting the skin of the face, upper parts of the chest, and back. Acne occurs most commonly during adolescence, and often continues into adulthood. For most people, acne diminishes over time and tends to disappear—or at the very least decreases—by age 25. Acne develops as a result of blockages in hair follicles. Enlargement of sebaceous glands and an increase in sebum production occur with increased androgen production during puberty and directly before menstruation. Sebaceous glands become clogged with sebum, a naturally occurring skin oil, and dead skin cells. Bacteria becomes trapped in these clogged follicles, producing pus and inflammation as the immune system attempts to destroy the bacteria. This buildup of pus results in a pimple. The most common bacteria that causes acne is Propionibacterium acnes, an anaerobic bacteria that is part of the natural bacterial flora of the face. androgen: A steroid hormone that stimulates or controls the development and maintenance of masculine characteristics in vertebrates. dermabrasion: A cosmetic medical procedure in which the surface of the epidermis of the skin is removed by abrasion, typically to remove scarring or sun-damaged skin. sebaceous gland: A gland of the skin that secretes an oily substance, sebum, usually into a hair follicle near the surface of the skin. 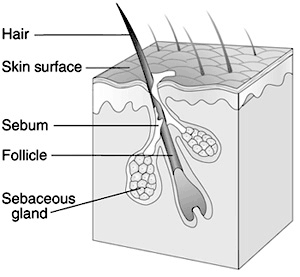 Hair Follicle: The sebaceous gland produces oily secretions that can block the follicle, resulting in a pimple. Acne, clinically known as acne vulgaris, is a common human skin disease affecting skin with the densest population of sebaceous follicles such as the face, upper parts of the chest, and back. Acne affects 40 to 50 million people of all racial and ethnic groups in the United States. Acne occurs most commonly during adolescence, and often continues into adulthood. For most people, acne diminishes over time and tends to disappear—or at the very least decreases—by age 25. Acne develops as a result of blockages in hair follicles. Enlargement of sebaceous glands and an increase in sebum production occur with increased androgen production during puberty and directly before menstruation. Sebaceous glands become clogged with sebum, a naturally occurring skin oil, and dead skin cells. Bacteria becomes trapped in these clogged follicles, producing pus and inflammation as the immune system attempts to destroy the bacteria. This buildup of pus results in a pimple. The most common bacteria that causes acne is Propionibacterium acnes, an anaerobic bacteria that is part of the natural bacterial flora of the face. As acne heals, it can cause scarring. Aside from scarring, its main effects are psychological, such as reduced self-esteem and in very extreme cases, depression or suicide. Acne usually appears during adolescence, when people already tend to be most socially insecure. 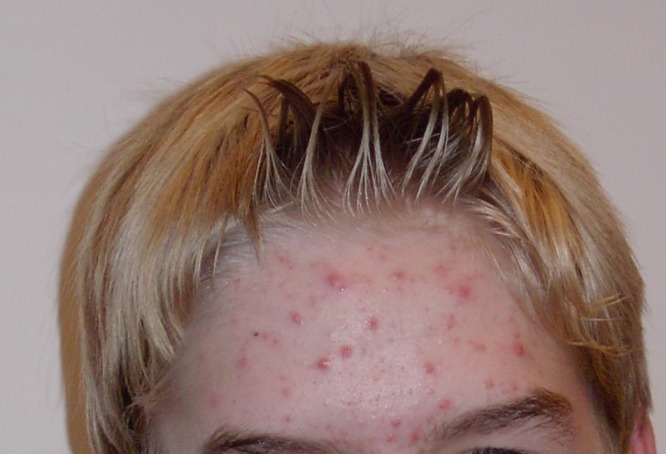 Acne: Acne of a 14-year-old male during puberty. Many different treatments exist for acne including benzoyl peroxide, antibiotics, retinoids, antiseborrheic medications, anti-androgen medications, hormonal treatments, salicylic acid, alpha hydroxy acid, azelaic acid, nicotinamide, and keratolytic soaps. They are believed to work in at least four different ways, including: normalizing shedding into the pore to prevent clogging, killing Propionibacterium acnes, anti-inflammatory effects, and hormonal manipulation. Laser treatment and dermabrasion can be used to reduce the appearance of scarring caused by acne.